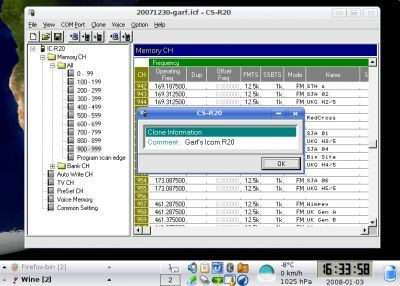 It seems that with a little determination, the CS-R20 for the Icom IC-R20 software can be persuaded to run on Linux. I eventually made the CS-R20 software load under Kubuntu Linux using Crossover (a commercial implementation of WINE). The method in this article should work with many other Debian-derived Linuxes too, perhaps with a little tweak here and there! The IC-R20's USB to RS232 chipset is automatically detected and a module is loaded for it in modern Linuxes - so no need for a driver. The only issue, at time of writing, is that whilst the CS-R20 software can write 100% reliably to the IC-R20 I am having problems reading from it as detailed at the end of this article. I am not sure why but when I find out I will let you know! In this instance we will use the Crossover Windows Application installer to create a "Windows 2000 Bottle" dedicated to the Icom software. Linux file naming is a little different from Windows. Please see Linux FHS article for more help and information about Linux file systems. Linux deals with serial ports differently from Windows. 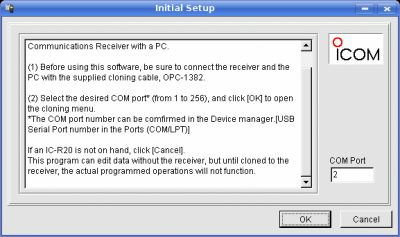 In Windows the serial ports are refered to as COM1, COM2 etc. In Linux the system accesses serial ports via a series of files /dev/tty0, /dev/tty1 etc. 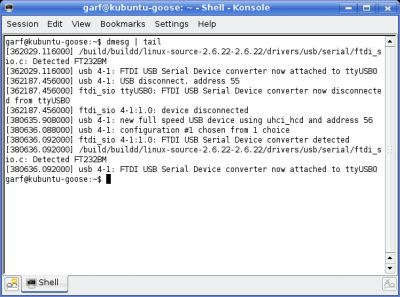 In the case of serial ports accessed via a USB converter, Linux accesses these ports via files called /dev/ttyUSB0, /dev/ttyUSB1 etc. The files /dev/ttyUSB0, /dev/ttyUSB1 etc are generated on the fly as you connect the USB cable and are deleted again when you remove it. 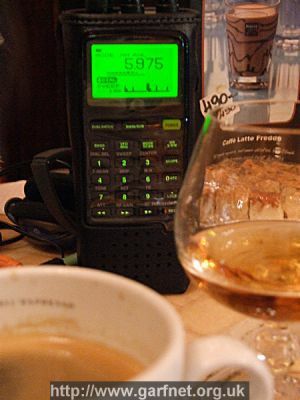 The IC-R20 is really communicating using a serial port. Inside the IC-R20 is a serial to USB converter based upon the FT245 series serial to USB chip. The driver for this is compiled into many modern Linux kernels. This family of chips is very common in devices that use USB to make a serial connection. It needs no additional driver in most modern Linuxes - unlike Windows. In order for Windows software running on Linux via WINE to access the Linux serial ports, it is necessary to build a symlink between where the application expects to find the serial port and where Linux actually handles it. Click the Crossover | Install Windows Software KDE or Gnome menu item. The installer wizard will appear. Tick the Install Unsupported Software box and click Next. Ignore the Before installing unsupported software... screen and cllick Next. Tick the Other installer file box and click Browse to find the CS-R20 set up file, setup.exe then click Next. Make sure the New Bottle box is ticked and in the box next to it type Icom. Also ensure that Create from Tempalte Win 2000 is selected. Click Next. The CS-R20 installer should now run just as if you were using Windows. The CS-R20 installer will ask all the usual questions such as what language you want to use (English or Japanese) and then for your serial number. When it has completed the Crossover installer will simulate a Windows reboot. You are done. A menu item for CS-R20 should appear in the KDE or Gnome menu. It should also geneate a desktop icon too. Switch on the IC-R20 and connect the USB Lead. Remember that the /dev/ttyUSB0 file is created on the fly and only exists when a connecton is made. When you reconnect your IC-R20 via USB and run dmesg | tail from a terminal window, you should see the USB converter is now loaded correctly.